The logic of the stone industry in Palestine is one of parceling and consecration: how to carve up the landscape in a way that is most efficient to the monetary value that can be gained from sacred stone. The industry echoes other mechanisms of colonization in Palestine: parceling the land through building the wall, bypass roads, and settlements. Through research and visual documentation by DAAR of the ways in which it is extracted, quarried, crushed, and turned to dust we have come to visualize the fragmented impact of the stone industry on Palestine. Now we propose a way in which this consecrated stone might be profaned and thereby returned to common use. While a quarry is the site of extraction and parcelling, an abandoned quarry can also be seen in another way: as the site where the quarry is re-assembled, re-habilitated, and re-used for other purposes. There are many reasons to rehabilitate abandoned quarry sites. Crushed stone prevents surface-to-ground water infiltration and is thus a tool for agricultural rehabilitation. Slurry from dump sites can be made into bricks for construction. The restoration of quarries can increase biodiversity and create more open social spaces uncommonly found in Palestine. Certainly one of the benefits of this restoration is for the stone industry itself to be able to exert claims of social responsibility. However, rehabilitation also increases the value of the land and has many practical uses for the common. Given the proximity of many archaeological sites to quarries, the preservation of quarries will also lead to the strengthening of cultural heritage. 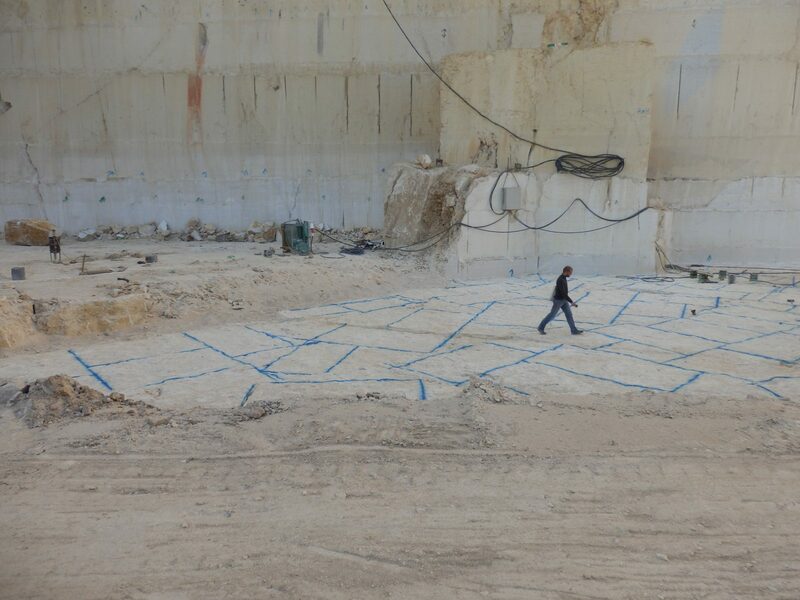 Architecturally, a restored quarry provides a place to re-activate the traditional uses of stone and its innovative use in Palestinian architecture today and a forum to discuss, investigate, and visualize the common. 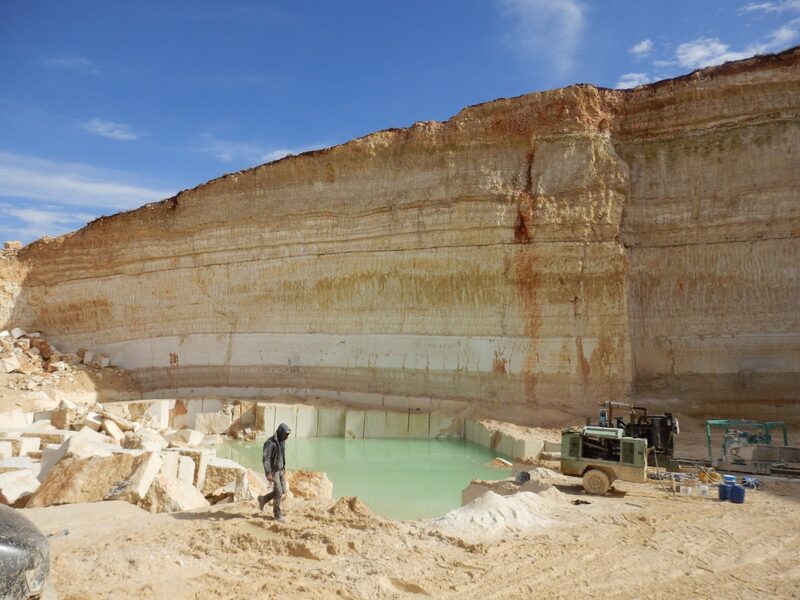 The myriad architectural possibilities of the quarry lead us to propose a project that will transform the quarry through a common determination of its future use. 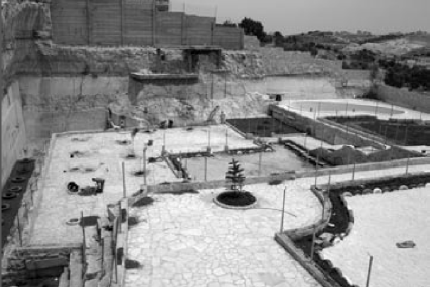 There are 48 abandoned quarries located in Area B in the municipality of Bani Na’im near the city of Hebron. 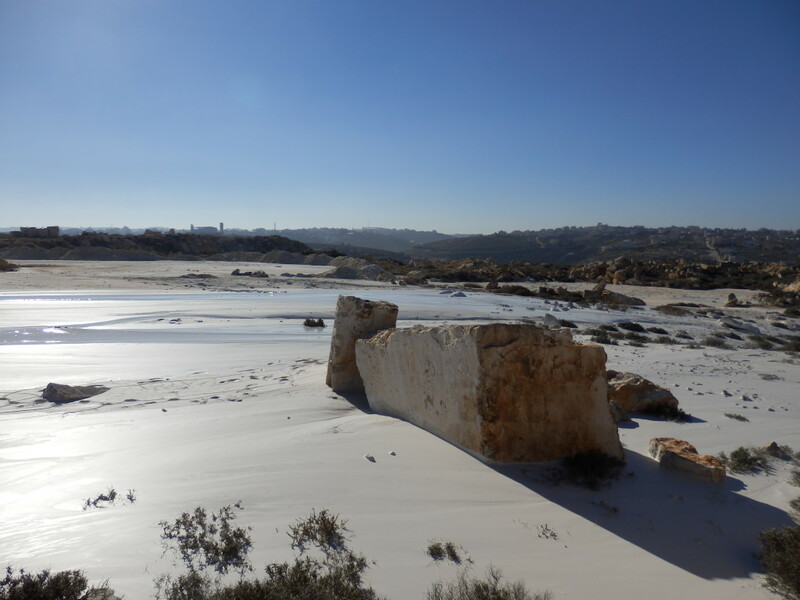 The area is known for illegal quarrying sites which the stone industry has created within the municipality itself. The impact of the stone industry in the municipality is high, and its risks are visible. Residents complain of dust, noise, water pollution, and high rates of lung cancer and pneumonia. Some residents have sold their homes to the industry, which demolishes them in order to continue building the mine. The proximity of the quarries to town infrastructure makes it particularly interesting to see how some of the quarries have been rehabilitated. The fragmented overlap of people’s lives with the quarry also urges the importance of determining the afterlife of abandoned quarries. Now some of them have been restored into agricultural land, a botanical garden, a community park, and a museum. A school was built on the site of an abandoned quarry that was already located in the middle of the town. The community park pictured above has a pool, garden, playground, and petting zoo. A large cistern built within the park recycles water for the pool and a fountain.